Topi Heikkinen has truly been an unstoppable force this season since hitting his “groove” at the dual Global RallyCross races at the Munich X Games. Shy of the first race that was won by Mini driver Liam Doran, Topi has won every single race – almost effortlessly. He became the first driver to ever win three straight GRC events and heading into the LA X Games, the Finnish racer was the early favorite to take home the final X Games gold of the 2013 season. The track at the X Games LA Global RallyCross event was great with a nice mix of tarmac, dirt and gravel with a mandatory “joker” shortcut lap that the drivers would take once per race. The track was fast all around with some tight intricate turns but sadly, there would be no high flying antics as the LA X Games didn’t feature a true jump area after Heikkinen and Grönholm were both injured in 2012 in LA due to a tricky jump. In the first heat race of the Los Angeles X Games brought out fast qualifier Brian Deegan alongside Svere Isachsen, Steve Arpin and Dave Mirra. After a good, clean start, Isachsen led the field into turn one and even with some serious contact from the Ford of Brian Deegan. Deegan was penalized for the contact with a stop and go penalty that seemed a bit hasty on the part of the GRC officials. In any case, as the field filed out, Deegan and Arpin got into the big, sweeping dirt turn – tossing both of the Fords into the outside barrier. This allowed Isachsen to run out away from the field but when Arpin was unable to get moving after the wall shot, the field was red flagged and the heat was restarted after Arpin’s Ford was removed. Once the track was cleared, Deegan, Isachsen and Mirra lined up for their second try at the first heat race of the day. On the start, the Subarus of Isachsen and Mirra quickly pinched in on Deegan which allowed Svere to once again pull out to a huge lead while Deegan and Mirra battled for second. Deegan and his Ford Fiesta would pull away from Mirra as he worked to run down the leader but the closest that he would get was on the 5th lap when he took the joker lap – pulling within a car length of Isachsen but never really challenging for the heat win. Isachsen took the win with Deegan finishing second to send them both to the finals. The second heat race of the LA X Games featured Liam Doan, Patrik Sandell, Rhys Millen and Anton Marklund in a battle for the two guaranteed spots in the final. After a good clean start, Doran in the Mini and Sandell in the Ford battled through the first few turns with the Monster Energy Drink Mini claiming the early lead. Sandell would spend the duration of the 6 lap heat race chasing Doran around the course but he would not be able to get ahead of the Mini as Doran took the win while Sandell’s Ford Fiesta would finish second. Heat race #3 brought out five drivers to battle for the two transfer spots to the final including Travis Pastrana, Scott Speed, Toomas Heikkinen, David Sterckx and Stephan Verdier. Not surprisingly, Topi Heikkinen tore off to the early lead while the other four cars fought hard through the first few turns with Travis Pastrana eventually claiming the second position while Scott Speed followed closely in third. Speed would post a good challenge for the second spot late in the 3rd lap when he took the joker turn but Pastrana and the Dodge Dart held off Speed’s Ford through the tight chicane and throughout the rest of the third heat race including an aggressive inside move in the dirt hairpin that would result in Speed spinning and Travis driving safely into the finals. Heikkinen won the race in – once again – dominating fashion. The 4th and final heat race of the LA X Games brought out the final five drivers hoping to get the quick ticket to the finals including Ken Block, Timur Timerzyanov, Tanner Foust, Bryce Menzies and Bucky Lasek. Foust, Block and Timerzyanov raced to the first turn with Block taking the lead with Timerzyanov in the VW second and Foust third when the field spread out a bit. During laps 2 and 3, Timerzyanov kept Ken Block busy as the two battled for the lead while Tanner Foust watch the fight from P3. Block would slowly pull away from the Russian and Foust would catch him, making it a race for second as Block pulled out to a big lead. Tanner and Timur would battle door to door for several laps, putting on an incredible example of why GRC racing is so great. When Timerzyanov got a little sloppy on the 5th lap, Foust was able to pull alongside and as they entered the final chicane before the finish line – the two cars came together and ran into the outside wall. Foust was able to get away from the contact to claim the second spot and Bryce Menzies in the Dodge snuck past the VW to grab the third spot. After a very exciting race, Block would drive to an easy win with Foust taking the second transfer spot to the finals. In the Last Chance Qualifier (LCQ), Dave Mirra, Rhys Millen, Scott Speed, Bryce Menzies, Anton Marklund, David Sterckx, Steve Arpin, Stephan Verdier and Bucky Lasek lined up to battle for four laps to see who would get the final two transfer spots to the main event. ON the start, Rhys Millen stumbled a bit and that forced Anton Marklund to swerve around him – forcing his VW Polo across the front of the Hyundai Veloster of Sterckx before slamming into the inside wall. Marklund’s car would then drift across the track slowly as the field pulled away…hitting the outside wall and coming to a rest. Scott Speed and Bryce Menzies would pull out to an early lead but it wouldn’t matter as the disabled VW forced a red flag condition and a restart. On the restart, a handful of drivers were unable to answer the bell so of the original LCQ field, only five cars lined up for the second try including Menzies, Speed, Millen, Lasek and Verdier. On the start, Speed pulled out to a quick lead while Millen and Menzies battled for P2. Speed and Millen would put some distance between themselves and Menzies as Millen’s Hyundai would take the lead away from Speed’s Ford late in the second lap. On the third lap, Menzies took the joker turn and looked as though he was going to take the lead and help to secure his first ever final race but as he tapped the wall coming out of the joker, he tapped the wall and broke the rear suspension. This allowed Millen to win the LCQ with Speed in second while the rest would not move onto the finals. In the finals, the ten drivers that finished either first or second in the four heat races and the LCQ lined up to fight for X Games Global RallyCross gold. On the front row was Block, Doran, Heikkinen, and Isachsen. Row two had Deegan, Sandell, Foust and Pastrana while row three had Millen and Speed. The action was hot and heavy early on with Svere Isachsen jumping the greenlight to take the early lead (which would result in a stop and go penalty) but as the field entered the first chicane, there was a massive crash that affected pretty much every driver except for Isachsen. Liam Doran got the worst of it and would not continue but out of the mess snuck Topi Heikkinen who grabbed the second spot behind Isachsen’s Subaru. Unbelievably, no red flag was waived to the field was left to race but when Svere Isachsen pulled into the penalty box, Heikkinen pulled into the first spot…and he would never look back. In the early going of the final race of the X Games LA Global RallyCross event, Heikkinen had a huge lead with Foust second, Isachsen third and Travis Pastrana fourth. Tanner would spend the entire 10 lap final race trying to chase down Topi but it was all in vain as the unstoppable finish force cruised to his 4th straight GRC win. Foust would take an easy silver medal position while Svere Isachsen would take the bronze. Ironically, in a GRC event that was jam packed with door to door, high impact racing – the final race was fairly uneventful. As Heikkinen put on a clinic on how to dominate a rallycross race, the final shootout to the gold medal looked more like a practice session with the field spaced out enough to prevent any real racing for position. 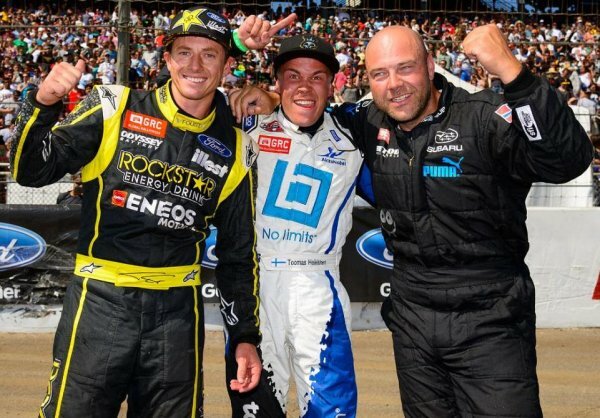 However, it was still another great GRC event that resulted in the unprecedented 4th straight victory for the young Finnish racer and his OlsbergMSE team. With a pair of Ford Fiesta rally cars once again claiming the first and second spots, Ford Motor Company has officially locked up the 2013 GRC Manufacturer’s championship. GRC has not yet updated their standings to reflect yesterday’s race but at this point, Topi has to have all but locked up the 2013 Driver’s Championship as well with just three events left.